Below you will find the data produced by the Alberta Favourability Mapping project created using the NTS (National Topographical System) grid cell data commonly used throughout Canada. The data has been made available to you to download and use for personal, academic and business ventures in order to assess and identify geothermal resource potential. The data is intended to serve as a geothermal exploration tool for making informed business decisions and mitigating investment risks. The Google Earth program is required to view the following maps. Click here to download a free copy of Google Earth. ​The Alberta Favourability Map project has included an estimate of Theoretical and Technical Potential as detailed by the methodology in the Global Protocol for Estimating and Mapping Geothermal Potential. Below the following graphs and tables you will find further information and descriptions concerning the classification of Inferred and Indicated Resources. 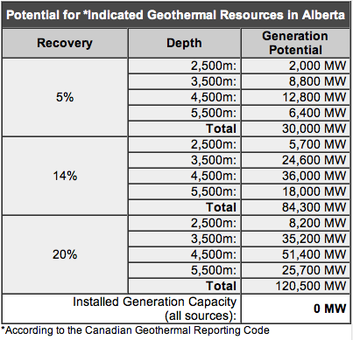 *It should be noted that all of the stated values are approximate and are only relevant to the data that we have available and thus do not fully represent the entire geothermal potential of Alberta. ​Technical Potential: “the fraction of the theoretical potential that can be used under the existing technical restrictions… structural and ecologic restrictions as well as legal and regulatory allowances” (Rybach, 2010). Theoretical Potential: an estimate of “the physically usable energy supply over a certain time span in a given region. It is defined solely by the physical limits of use and thus marks the upper limit of the theoretically realizable energy supply contribution” (Rybach, 2010). The Google Earth program is required to view the following maps. Click here to download a copy of Google Earth. The Alberta Google Earth maps are currently unavailable. Please use the PDF version below for now. * Please note that the Methods & Data Sources report is not a summary of the analysis of the data, but is rather a summary of the methodology used to produce the Alberta Favourability Maps. 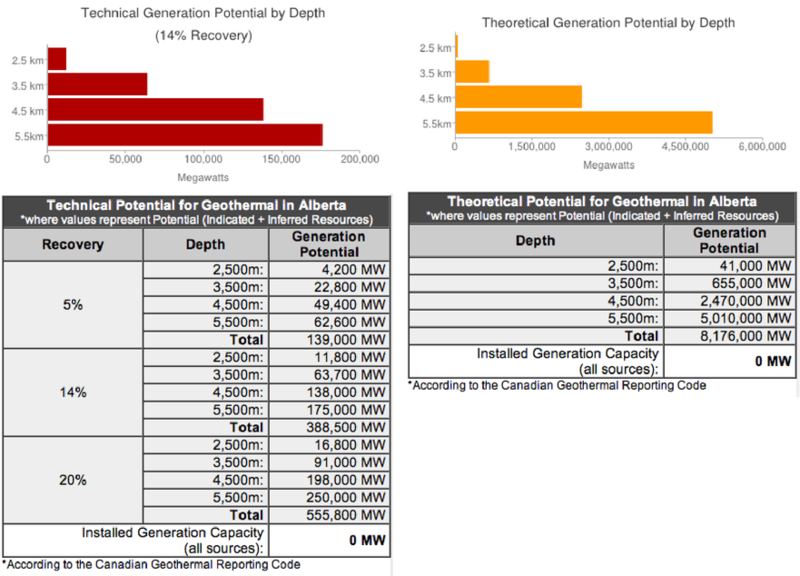 Following the Canadian Geothermal Code for Public Reporting, the Reporting Code maps represent the level of confidence that has been assigned to the data found within each grid block. This was done by analyzing the data points according to the Reporting Code and subsequently classifying each block as an Inferred or an Indicated Resource, suggesting a lower or higher level of confidence, respectively. An ‘Indicated Geothermal Resource’ is that part of a geothermal resource that has been demonstrated to exist through direct measurements that indicate temperature and dimensions so that recoverable thermal energy (MWth-years) can be estimated with a reasonable level of confidence. Thermal energy in place has been estimated through direct measurements and assessments of volumes of hot rock and fluid with sufficient indicators to characterize the temperature and chemistry. Direct measurements are sufficiently spaced so as to indicate the extent of the thermal energy in place. ​The Reporting Code was prepared by the Canadian Geothermal Code Committee and published in 2010. It is a required minimum standard for public reporting. If you would like to obtain a copy of the Code, please visit the “Code." Below you’ll find the database used for the generation of the Alberta Favourability Maps.